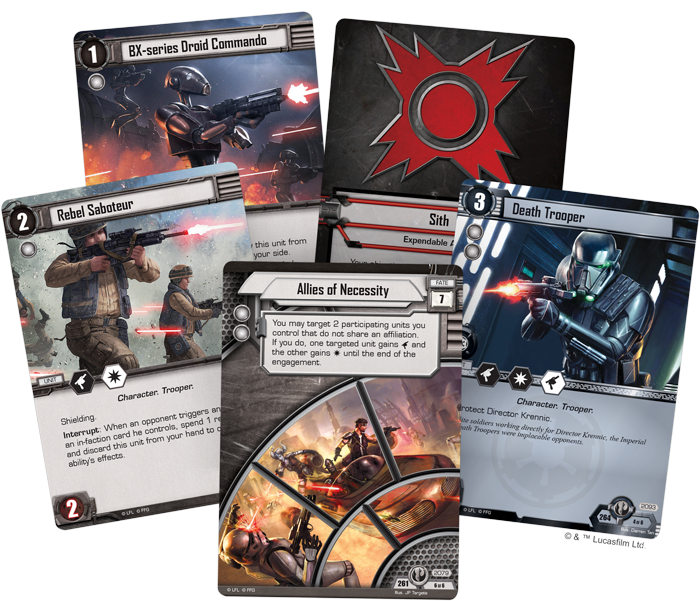 Fantasy Flight Games is proud to announce Allies of Necessity, the first Force Pack in the Alliances cycle for Star Wars™: The Card Game! Within the new Alliances cycle, you gain plenty of incentives to bring multiple affiliations together. 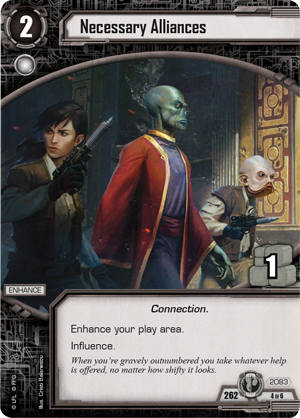 While multi-affiliation decks have always been a possibility in Star Wars: The Card Game, Allies of Necessity offers more tools to help you than ever before—starting with new affiliation cards, which offer new deckbuilding requirements and special abilities. What’s more, you’ll find iconic characters from Rogue One, Star Wars Rebels, and the Darth Vader comics throughout the cycle: in fact, this first Force Pack includes Doctor Aphra, Director Krennic, Captain Cassian Andor, and Jyn Erso. With eight new objective sets (two copies each of four distinct sets), and twelve brand-new affiliation cards (two for each affiliation), Allies of Necessity promises to change your games like never before! With two new affiliation cards for every affiliation in the game, it’s impossible to escape the implications this expansion has for your deckbuilding. Each of these new affiliation cards introduces deckbuilding restrictions alongside a benefit for you to take advantage of. For example, one of the new Smugglers and Spies affiliation cards is Desperate Allies (Allies of Necessity, 2067). Desperate Allies forces you to include exactly five Smugglers and Spies objective sets and exactly five Jedi and/or neutral objective sets in your deck. Splitting your deck along these lines could create problems finding a consistent resource match for your cards, but this cycle’s new benefits for mixing affiliations could certainly outweigh those concerns. And if that weren’t enough, Desperate Allies also lets you remove a focus token from any unit you control after you refresh, making you even more resistant to tactics icons that might disable your units. 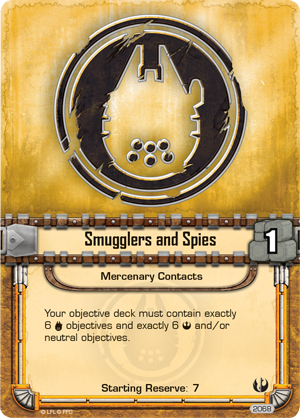 The other Smugglers and Spies affiliation card— Mercenary Contacts (Allies of Necessity, 2068)—offers a dramatically different approach to building your deck. Here, you must include six Smugglers and Spies objective sets and six Rebel Alliance or neutral objective sets. In most cases, increasing your deck size decreases the consistency of your deck, but this affiliation card also carries a starting reserve of seven: helping you draw through your deck faster and giving you more options when you’re deploying your units or participating in an edge battle. Whether you choose one of these new affiliation cards or rely on the original largely depends on what style of deck you’ll choose to build. These new cards require you to evenly mix affiliations, but that’s not always a bad thing, as some of these new objective sets can prove! Rebellions are built on hope, but they’re built by beings from hundreds of worlds, coming together with a common goal of defeating the Galactic Empire. 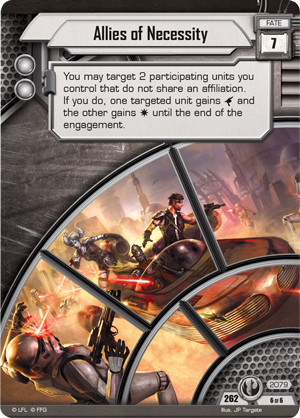 Few objective sets yet released reward you as much for mixing affiliations as the new Smugglers and Spies objective set from Allies of Necessity. 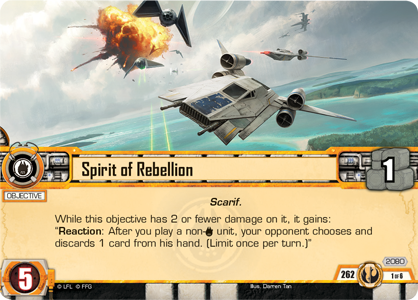 To begin, you may call upon your allies to reduce your opponent’s options with Spirit of Rebellion (Allies of Necessity, 2080). While this objective has two or fewer damage, you can force your opponent to choose and discard a card when you play a non-Smugglers and Spies unit! You’ll almost always play units during your deployment phase, which lets you use this ability to whittle away at your opponent’s options and put you in a better position to win edge battles later. 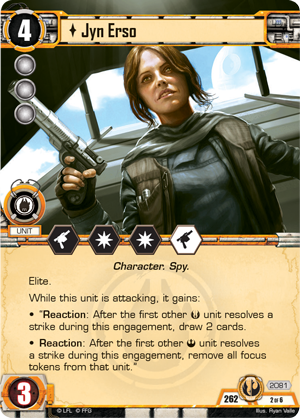 Of course, the primary reason you’ll include this objective set in a dual-affiliation deck is none other than Jyn Erso (Allies of Necessity, 2081), one of the best “team player” units in the game. Not only does Jyn feature a range of combat icons and the elite keyword, she gains powerful benefits for allying with Jedi and Rebels. 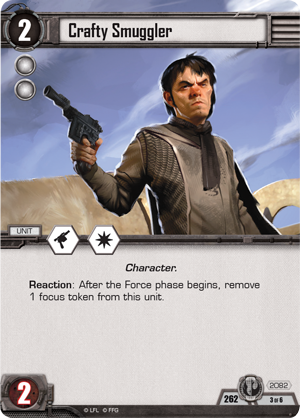 In fact, while Jyn Erso is attacking, you can draw two cards after your first Jedi unit strikes and clear all focus tokens from the first Rebel Alliance unit that strikes! Any time that you’re leading a diverse group of units into battle, you’ll want Jyn Erso to be leading the charge. Allies of Necessity (Allies of Necessity, 2079), one of the new fate cards introduced in this cycle, also rewards you for crossing affiliations. When this fate card resolves, you can choose two participating units that don’t share an affiliation—one of those units gains a unit damage, and the other gains a blast damage until the end of the engagement! You don’t even need to venture outside this objective set to find two targets for this fate card. Jyn Erso and the Crafty Smuggler (Allies of Necessity, 2082) are perfectly suited to infiltrating Imperial bases and completing their mission with help from Allies of Necessity. Finally, if you’re concerned about finding the resource match to play your cards while playing a multi-affiliation deck, this objective set contains Necessary Alliances (Allies of Necessity, 2083). With the influence keyword, this enhancement’s resource can provide a resource match for any affiliation, ensuring that you’re always able to play the cards you need. You may have made it this far on your own, but you’ll need to forge alliances to keep your fighting spirit alive. Prepare for the Alliances cycle to begin, and look for Allies of Necessity at your local retailer in second quarter of 2017. 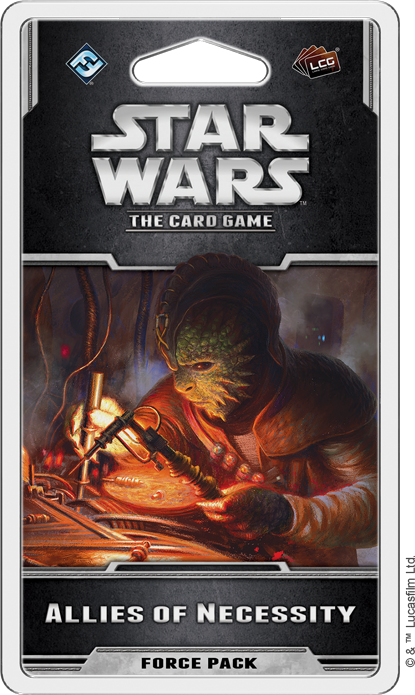 The characters, starships, and situations of the original Star Wars trilogy come to life in Star Wars: The Card Game, a head-to-head Living Card Game® of tactical combat and strategic planning that allows two players to wage cinematic combats between the light and dark sides of the Force.